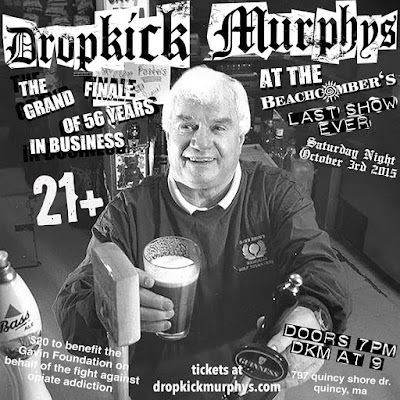 Hometown heroes Dropkick Murphys announced a return to Quincy, MA to play (yet another) final Beachcomber Show. Rumored forever ago to be closing its doors, the longtime beachfront divebar on Quincy Shore Drive finally confirmed back in August that the 56-year old establishment would cease to exist come the fall. Since then, at least three farewell 'comber shows have been scheduled. "We are proud to announce that we will be performing a special show in honor of the closing of the world famous Beachcomber - Quincy in Quincy, Mass. The owners, the McGettrick family, are lifelong friends of Ken’s, and we are honored to be playing the final show there. Only 250 tix will be on sale. Here’s how you can get tickets: 150 tickets will be available online, starting at NOON TOMORROW. 100 tickets will be on sale at the Beachcomber starting at NOON SATURDAY. You can purchase a maximum of 2 tickets. The times for Saturday night are as follows: Doors 7pm - Show 9pm." Tickets go on sale 12noon Friday 10/2/15. Ticket Link. The Beachcomber is located at 797 Quincy Shore Drive, Quincy, MA.